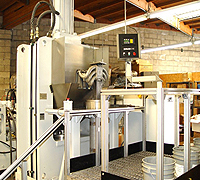 What are some ideal applications for abrasive flow deburring in Dallas TX? Aerospace: The abrasive flow deburring process was actually invented for the aerospace industry. At Extrude Hone AFM, we continue to provide abrasive flow deburring in Dallas TX up to the extremely high standards and tight tolerances required for aerospace applications. Automotive Engines: Extrude Hone AFM pioneered the process of abrasive flow deburring for automotive engines. By uniformly smoothing and polishing the interior passages of parts like intake manifolds, abrasive flow deburring in Dallas TX can increase air and fuel flow through the engine, thus increasing horsepower, thrust, torque, and efficiency. Food Processing Equipment: There are two main problems that burrs present in equipment used to process food: contamination from bacteria trapped on and around the rough burrs, and contamination from the burrs themselves breaking off and mixing with the food product. Treating parts with our Ultra Pure abrasive flow machining process can prevent these issues.